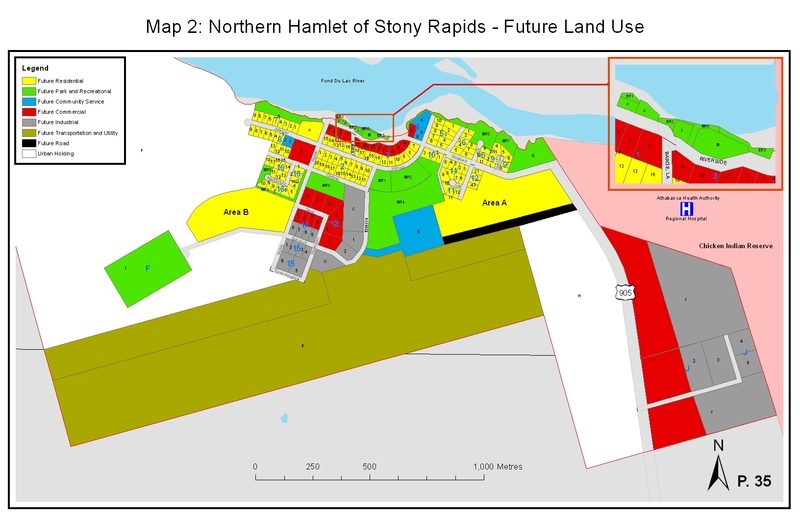 Stony Rapids is one of the most northern municipalities in Saskatchewan, and in 2011 the Hamlet adopted their Official Community Plan and Zoning Bylaw from the Planning for Growth North program, officially coming into effect on May 10, 2012. With a population of 262 people, Stony is the largest community in Saskatchewan north of 59th parallel and a regional hub for the area. With a pristine environment surrounded by beautiful lakes, rivers and boreal forest, Stony Rapids offers a wonderful destination for outdoor adventurers and thrill seekers. The Northern Hamlet of Stony Rapid's vision is to enhance their position in the Athabasca Region as the major service provider and employment centre and to create a variety of recreation and tourism opportunities for its residents and visitors. The people of Stony Rapids strive to create a safe community that provides safe routes for dangerous goods, is pedestrian friendly, and is free of conflict between vehicles and pedestrians. Council is dedicated to ensuring the needs of residents are met, and that the community is evolving into an attractive, prosperous, diverse, and sustainable place to live, work, and play. Official Community Plan (2011): Stony Rapids was one of the first northern communities to participate in the Planning for Growth Northern Program, and adopted their Official Community Plan in 2011. The implementation process is underway and the vision within this plan is directing all future development within the municipality. Zoning Bylaw (2011): This document, also adopted in 2011, outlines all the logistics and regulations associated with building and development within the municipal boundaries of the Northern Hamlet of Stony Rapids. The regulations and standards enforced through this document allows for the consistent implementation of building and development within the municipality. Current Land Use (2011): In order to understand how development and planning can change in the future, a review of current and existing uses for areas within the municipality is needed. 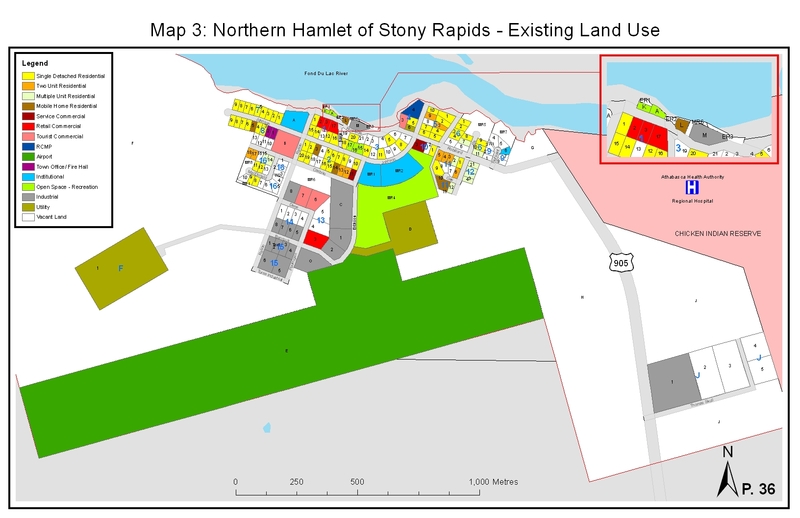 This map shows how the land within Stony Rapids is currently being used (i.e., residential areas, commercial areas, etc). Future Land Use Maps (2011): The Official Community Plan is about outlining the best location for types of future development to occur. It is beneficial to group similar land-uses together for various reasons, such as, easy access to lots, noise, aesthetic views, existing zoning, or adjacent land uses. This maps identifies the most ideal locations for various types of development. 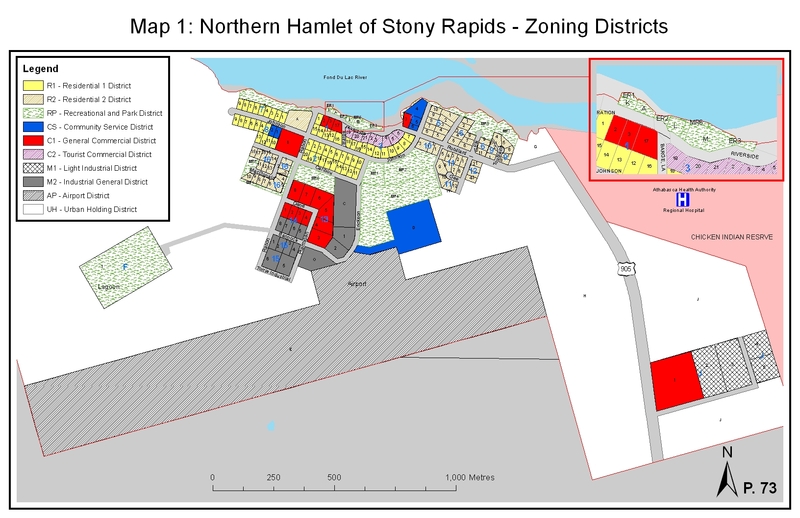 Zoning Districts Maps (2011): The Zoning Bylaw is about the implementation of regulations that control building and development within the Northern Hamlet of Stony Rapids. By having certain districts agglomerated in certain areas there is less likelihood for opposing land uses and frustration between property users. This map show the different districts within the municipality. Development Permit Application: When landowners, residents, or developers want to build, adapt, or update physical structures on properties this form must be completed and submitted for approval before proceeding with the development. Home-based Business / Bed and Breakfast Permit Application: Within the Northern Hamlet of Stony Rapids, the Zoning Bylaw states that home-based and bed and breakfast businesses must be approved by leadership to ensure that the business does not interfere within the residential neighbourhood. This application form can be filled in and submitted to the Development Officer. Notice of Decision: When the development permit application is decided upon by the Development Officer in Stony Rapids, the following form will be provided back to the applicant explaining the decision.